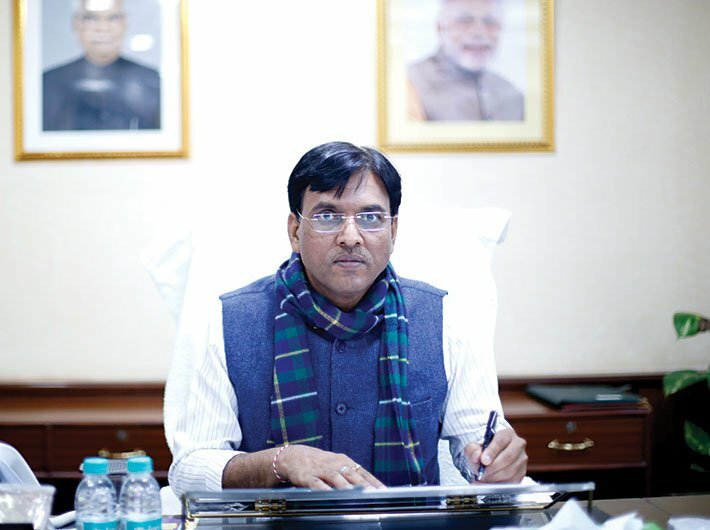 Union minister Mansukh L Mandaviya, 45, is among the younger politicians to have made it to the cabinet. He is in charge of road transport and highways, shipping, chemicals and fertilisers. In a freewheeling interview with Pankaj Kumar, he speaks on the budget and the state of the economy. In the last four years, there has been considerable development of road infrastructure. How does the current budget hope to take that forward? The Modi government has touched new heights in the highways sector. The average annual construction of national highways during the UPA government’s last three years in office was 5,002 km. In three years, our government has touched 6,234 km, a jump of some 25 percent. In 2017-18, we hope to complete more than 9,000 km. The budget has been increased to Rs 71,000 crore for 2018-19 from Rs 64,900 crore in the ongoing fiscal. Higher allocation for the roads sector will help in creating more employment opportunities and contribute significantly to the economy. It is estimated that India needs Rs 50 lakh crore in infrastructure sector, including roads, air, rail and inland waterways. To raise equity from the market for its mature assets, NHAI will consider organising its road assets into special purpose vehicles and use innovative monetising structures like toll, operate and transfer (TOT) and infrastructure investment funds (InvITs). One of the most ambitious projects of your ministry is the Rs 7.5 lakh crore Sagarmala project, revolving around port development and coastal shipping. Can you share the details? The main vision of the Sagarmala programme is to reduce logistic cost for exim and domestic trade by promoting port-led development in the country and harnessing India’s long coastline. Under this programme, ports would be modern, with state-of-the-art equipment, so that the turnaround time (TAT) can be brought down. Sector special industrial clusters under coastal economic zones would be developed. To promote coastal shipping, a dedicated coastal berth scheme has been framed and financial assistance is being given to ports. Fourteen coastal economic zones (CEZ) across all coastal states have been proposed for development of potential port-linked clusters across three sectors, namely energy, material and discrete manufacturing and 13 bulk cluster for basic input industries. In order to develop coastal community, skill development of fishing communities is being taken up along with the development of fishing harbours across the coastline. Since the inception of the Sagarmala programme, out of 38 rail connectivity projects, 14 projects have been awarded and DPR has been prepared for two projects. The projects identified under Sagarmala are expected to mobilise more than 8 lakh crore. They will enable us to save Rs 35,000 crore yearly in logistics, and over the next 10 years, they will create one crore jobs, including 40 lakh direct jobs. The Bharatmala project, to which cabinet gave the nod on October 25, is one of the biggest highway projects. Can you share details of its implementation? Out of total 94 road connectivity projects, 58 projects will be taken up under Bharatmala. Two projects have been implemented and 18 are under implementation. For smooth movement of containers to and from the port, 10 freight-friendly expressway projects have been identified and two of these, from Ahmedabad to JNPT, Navi Mumbai, and Bengaluru to Chennai, are in the planning stage. What progress has been made on the proposal of direct benefit transfer (DBT) of fertilisers? The government introduced DBT system for fertiliser subsidy payments on the basis of actual sales made by retailers to beneficiaries. Sales will be made through PoS devices and beneficiaries will be identified through Aadhaar card, voter ID, etc. A project monitoring cell is in place to oversee implementation of DBT. States and UTs have been put on Go-Live mode from September 2017 on. Till date, 25 states/UTs have been brought under the DBT framework. Approximately 1.8 lakh retailers were sensitised during the introductory training sessions 89 percent of PoS devices have been deployed across the country. What is the status of Jan Aushadhi Kendras? Have the targets of last year been achieved? As on February 5, there are 3,109 Pradhan Mantri Bhartiya Jan Aushadhi Kendras functioning in 33 states and UTs. The target was 3,000 kendras. Out of the 718 district in the country, 584 districts are covered by the kendras. There are more than a thousand items in the product basket. The average per-day sales is Rs 3,300, which is equivalent to Rs 15,000 in branded product sales. Till May 2015, there were only 99 kendras. This went up to 269 in 2015-16, 1,080 in 2016-17, and 3,109 in 2017-18. The PM and the BJP have drastically brought down the prices of quality medicines, making them available to large sections of the poor. The medicines available at these kendras are priced 50-90 percent less than branded medicines, leading to savings of Rs 400 crore for citizens. In January 2017, fertiliser minister Ananth Kumar wrote to the finance minister for Rs 20,000 crore special banking arrangements to provide loans at reasonable rate to cash-starved fertiliser companies. What initiatives are being taken on this front? It is under consideration of the government. India, the world’s second-biggest consumer of urea, is boosting production of the crop nutrient and seeking to end imports in the next five years. What are the plans for the current fiscal year? In the fertiliser sector, how long will it take to become self-sufficient? In 2016-17, indigenous urea production was 242 lakh tonnes and imports were 54 lakh tonnes. Expected additional indigenous production by 2022 (in lakh metric tonnes) would be through revival of five plants [2 units of FCIL, in Ramagundam and Talcher, and three units of HFCL in Barauni, Sindhri and Gorakhpur] which is 63.5 lakh tonnes, 13 lakh tonnes of green field plant (Matix Fertilisers) and 13.4 lakh tonnes of Brownfield plant (Chambal Fertilisers). With additional indigenous production, the country would be self-sufficient by 2022. How is neem coating of urea benefitting farmers? Neem-coated urea slowly releases nitrogen and lowers consumption. As per a study conducted, there has been an increase in yield of various field crops due to optimum use of fertilisers. Neem also has pesticide quality and thus also helps in pest control. Diversion of subsidised urea for commercial use has been stopped and thus reducing burden of subsidy on the government.